Better knowledge of the condition will help to improve the referral and management of children who have suspected retinoblastoma, writes Mr Ashwin Reddy. Babies and young children are facing serious delays in receiving life-saving treatment because their symptoms are often missed by frontline healthcare professionals. The Childhood Eye Cancer Trust (CHECT) has launched an awareness campaign after information gathered by the charity on children diagnosed with retinoblastoma (Rb) in the UK in 2012 indicated that 72% of GPs did not make an urgent referral, as recommended in NICE guidelines. About 40-50 cases are diagnosed each year in the UK. The condition can occur either unilaterally or bilaterally, generally before the first five years of life. Rb may be sporadic or inherited. The Rb gene, RB1, is found on chromosome 13 and there are two copies of it. Tumours develop in the retinal cells, which are growing rapidly in early life. The process of cell development continues throughout infancy and the retina is fully developed at approximately five years of age. Rb is a life-threatening disease, but 98% of children survive it in the UK. It is heritable in 45% of cases and a child who inherits the altered Rb gene has a 90% chance of developing the condition, so screening from birth at an Rb treatment centre is vital for suspected cases. There are several signs, described below, which could indicate Rb. It is also important to remember that a child with Rb may appear systemically well. Leukocoria - (intermittent) white pupillary reflex noticed in dim lighting or in a photograph. 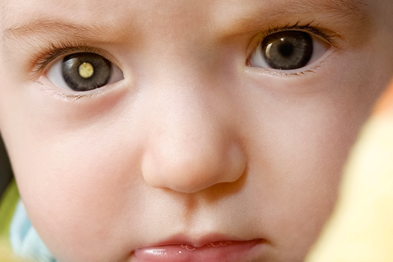 Strabismus - squint (Rb must be ruled out for all cases of squint in babies and children using a red reflex test). A change in colour of the iris. An absence of 'red eye' in one eye only in flash photographs. Red, sore or swollen eye without infection. If a child presents with any of these signs, a red reflex test must be performed with a direct ophthalmoscope. 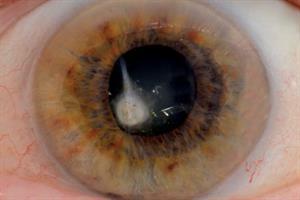 If it is true leukocoria, other vision-threatening conditions need to be investigated, such as Coats' disease. Carry out a red reflex test in every case of parental concern regarding the eyes. Children with Rb usually show no other signs of illness to alert you to the condition. GPs may only see one patient with this condition during their career, but it is paramount that the child's signs are picked up as soon as possible. All suspected cases or cases where Rb cannot be ruled out by the test must be referred urgently to the local ophthalmology department. It is important to be aware that the child may be able to see (using the other eye) and will not be unwell, despite having a life-threatening cancer in the eye. It is recommended that GPs call the ophthalmologists to alert them and to find out the speed with which their urgent referrals are seen (it can be longer than two weeks). If the ophthalmology department identifies or suspects Rb, an urgent referral is made to one of two NHS specialist Rb treatment centres in the UK - Birmingham Children's Hospital or the Royal London Hospital. Swift referral is important, as this can reduce the long-term impact of the disease and therapy. Although this cancer has a very high survival rate, many children live with the consequences of a delayed diagnosis. 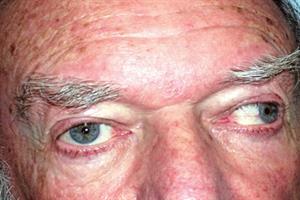 This can mean loss of one or both eyes, an artificial eye, a visual impairment or, in some cases, complete blindness. In unilateral cases, 70% of children will need to have their eye removed to save their life. If a child is referred to an ophthalmologist, it is appropriate to inform the patient and the parents about your concerns and suspicions. This can be done by telling the child and the parents that a specialist eye examination is made for many reasons and it is important to rule out anything serious. Rb can be hereditary, so adults who have had Rb and wish to have children should be offered genetic counselling and testing. Information on the genetics of Rb was scarce 20 years ago, so many patients who carry the altered gene may be unaware of the risks associated with this. Testing can include pre-implantation genetic diagnosis, chorionic villus sampling at 11 weeks of pregnancy, or amniocentesis at 16 weeks of pregnancy. There is an increased risk of second primary cancers to those with the inherited form of Rb.5 Patients surviving this form of Rb have an increased risk of developing sarcomas within about five to 25 years of treatment. They are also at increased risk of developing other forms of cancer in later life. The level of risk also depends on the treatment for Rb. Be alert to any reports of unexplained or persistent pain, lumps and the development of new moles or changes to existing moles. Adults who have had Rb should be seen regularly in an adult oncology clinic. Patients with a visual impairment may seek frequent appointments with their GP for a complete body skin check, because they will be unable to see any potentially malignant skin lesions themselves. It is important for GPs to be aware of the lifelong support needs of someone who has had Rb because patients will often use primary care as their first port of call to access relevant services. 1. Butros L, Abramson D, Dunkel I. Delayed diagnosis of retinoblastoma: analysis of degree, cause and potential consequences. Pediatrics 2002; 109(3): e45. 2. Wallach M, Balmer A, Munier F et al. Shorter time to diagnosis and improved stage at presentation in Swiss patients with retinoblastoma treated from 1963 to 2004. 3. Goddard A, Kingston J, Hungerford J. Delay in diagnosis of retinoblastoma: risk factors and treatment outcome. Br J Ophthalmol 1999; 83(12): 1320-3. 4. Muen W, Hindocha M, Reddy MA. The role of education in the promotion of red reflex assessments. JRSM Short Rep 2010; 1(5): 46. 5. Halford L, Cole T, Kingston J et al. Retinoblastoma for life. Focus: The Royal College of Ophthalmologists. Summer 2008: 5-6. As part of the awareness campaign, a toolkit for healthcare professionals is being distributed by CHECT supporters to surgeries and clinics around the country, highlighting the main symptoms and the importance of an urgent referral when Rb is suspected. If your surgery or clinic has not already received this toolkit, contact CHECT at info@chect.org.uk or 020 7377 5578.